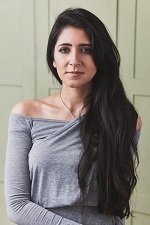 Editorial director Emma Smith acquired World All Language rights to Nikita Gill’s brand new collection of writing, Great Goddesses (Ebury Press, 5th September). According to the acquisition statement: 'Inspired by ancient Greek mythology – from the potent venom of Medusa, and transformative sorcery of Circe, to the rising up of Athena over Olympus – Nikita, in her inimitable poetry and prose, tells the stories of the mothers, warriors, creators, survivors and destroyers that shook the world. Smith said: "Nikita has an incredible ability to imbue ancient stories with modern magic so I am thrilled to be publishing her new book at Ebury. While having over half a million followers online, Great Goddesses showcases the true depth and wonder of Nikita’s writing and will be a book to treasure. I can’t wait for even more readers to discover her beautiful and timely words." Gill said: "I am very excited to be working with wonderful team at Ebury on Great Goddesses, a book which promises to be the seeds of an evocative series of stories." Gill is a British-Indian writer and artist living in the south of England. With over half a million Instagram fans, 100,000 followers on Facebook, and celebrity fans, including Cara Delevingne, Alanis Morissette and Nicole Richie, Gill is thought to be the UK’s most followed poet.